For a holidaymaker in the 1990s it was the essential accessory. The plastic disposable camera had its drawbacks — a strict limit of 27 photos on a roll that took three days to develop at your local pharmacy — but was cheap enough not to matter if it was lost or stolen. 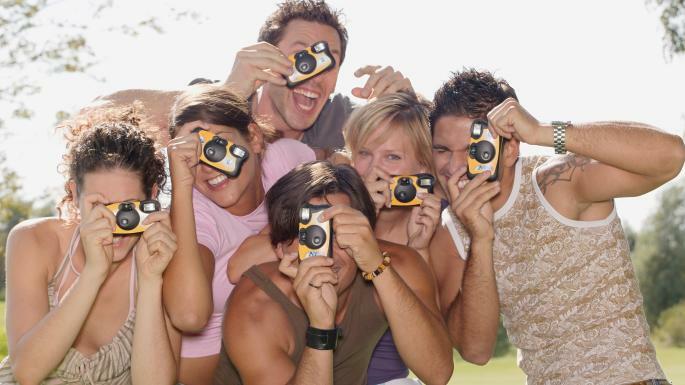 Now instant cameras are making a comeback with the selfie-obsessed iPhone generation. Fujifilm expects to sell 7.5 million this financial year, including Instax instant cameras – up from 6.5 million last year and 3.9 million in 2014-15. It says many buyers are teenage girls or women in their early 20s who are sick of the “fake life” created with carefully edited smartphone pictures. Fujifilm’s 35mm Quicksnap camera, which costs £5.99, is experiencing the biggest renaissance. Smartphone app developers are joining in the craze for old technology. A South Korean developer has created a disposable camera app for the iPhone, Gudak Cam, which is modelled on an old fashioned Kodak, and allows you to take a roll of 24 photos through a tiny viewfinder and then forces you to wait the requisite three days to see the results.